There's no better way to see Sydney than by water. 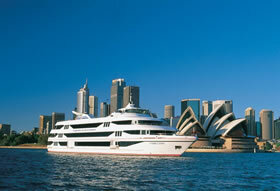 Fitting for a city married to its harbour; Sydney offers some of the best cruises in the world. Whether you're visiting for just 24 hours and want to see as much as you can within a day or you're here for longer and are looking for a new perspective, the Sydney Harbour highlights cruises are the best way to soak up the city's unique flavour. Glide past Sydney's great monuments in under an hour with a sightseeing tour that takes you to best known landmarks, including The Rocks, Sydney Opera House, Sydney Casino, Fort Denison, the Botanical Gardens and the spectacular city skyline. On board a $5 million catamaran with a complimentary bear or soft in drink hand, you'll never want to disembark. Alternatively, experience the harbour from the deck of a 40-foot yacht. With the unique opportunity to steer, rig and sail the vessel, you'll spend a day gliding under iconic sites such as the Harbour Bridge and Opera House before disembarking on the historic Store Beach for a beautiful lunch and opportunity to relax and explore. Another great way to see the city are the hop-on-hop-off options, designed for the traveller who wants to get out and explore the landmarks that pass by. Offering great flexibility, these services include ongoing commentary and are an excellent way to efficiently get around Sydney, especially for those travelling as a family. Finally, some of the best Sydney Harbour cruises venture beyond the protected harbour and into the wide ocean. With multiple viewing decks visitors often spot Humpback and Southern Right whales up close; a truly Australian experience.